No matter how many books and articles are written about The Stranger—and there are hundreds of them—the power of this little novel remains a mystery. Yet with all of the accolades heaped upon this work and the analyses of its literary, sociological, and geopolitical qualities, until now, there’s been very little written about exactly how Camus created this singular book, a classic that has sold over 10 million copies and has been translated into close to 60 languages; it has become a rite of passage synonymous with coming of age as a reader and a thinking person. 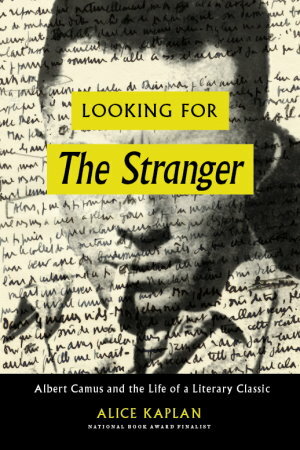 Looking For The Stranger: Albert Camus and the Life of a Literary Classic is the story of the creation of this fascinating book and how it came to be published, in the most difficult climate for publishing in French history, under Nazi Occupation with paper in short supply and a censor approving everything. It’s one of the most astonishing stories of a literary success and one that introduces readers to how Albert Camus wrote this novel – or perhaps how he discovered it within himself – touching on the book’s genesis, its Algerian setting, and its fascinating road to publication during the Nazi occupation of France. As a wonderful literary footnote, Kaplan may have discovered the name of the elusive “Arab” whose stabbing on a beach in Algeria in part inspired Camus’s novel.